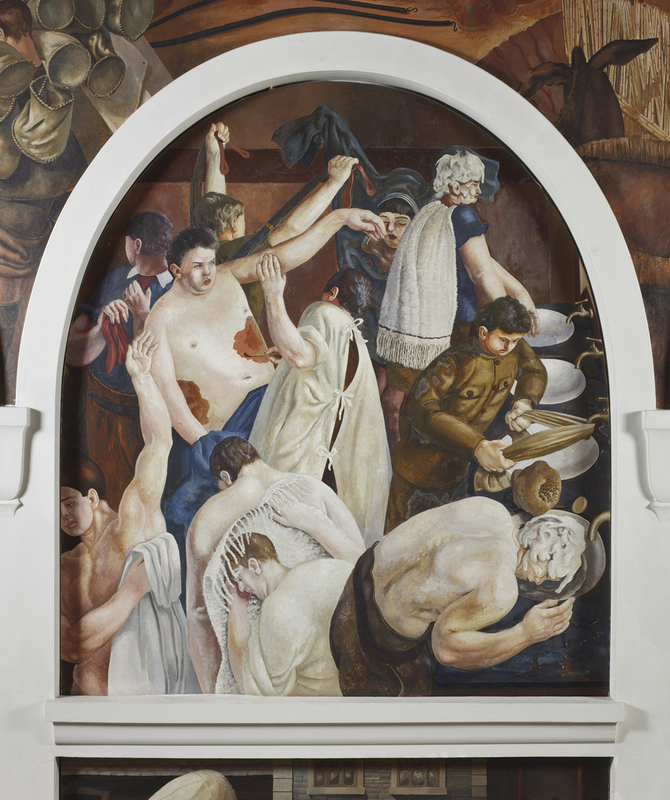 ‘Stanley Spencer: Heaven in a Hell of War’, currently showing at Pallant House Gallery, Chichester, is one of the most important art exhibitions of 2014. It provides a once-in-a-lifetime opportunity to see the work of this exceptional British artist in an intimate gallery space. The Oratory of All Souls was built by John Louis and Mary Behrend to honour the ‘forgotten dead’ of the First World War and they commissioned Stanley Spencer to create art for the interior, impressed by his reminiscences of the Macedonian campaign. The chapel was later dedicated to Mrs Behrend’s brother, Lieutenant Henry Willoughby Sandham, who had died of an illness contracted while serving in Macedonia. Sandham Memorial Chapel, as it subsequently became known, was gifted to the National Trust in 1947. 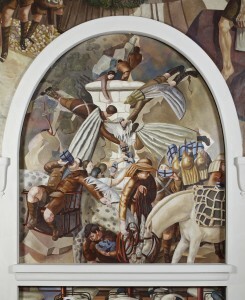 Spencer was inspired by the work of the 14th century Italian artist Giotto Di Bondone and it is no accident that the scheme of the chapel interior was based on Giotto’s Arena Chapel in Padua. Since the Renaissance we have become used to viewing art in frames. While the work may invite us in, we nevertheless remain the viewer. The painted medieval church is different; here we inhabit the piece of art, joined with the narratives displayed all around us. It is the gift of this remarkable show to allow us to inhabit Spencer’s narratives in this way. In viewing this art, the qualities of the aesthetic and the religious are held in tension. This shared heritage inspires a vital experience. 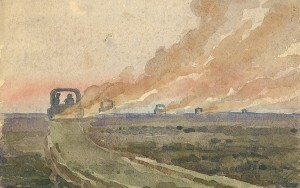 The pictures were painted from memory on canvas between 1927 and 1932. 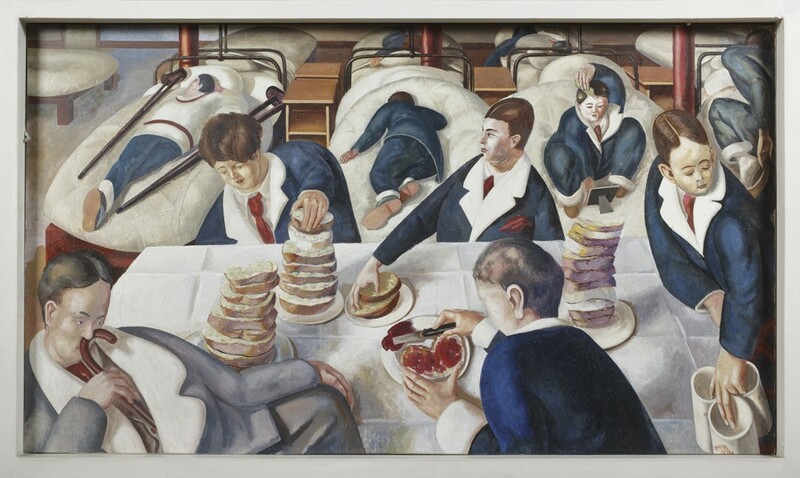 They reflect Spencer’s very particular perspectives resulting from his experience of war and are a fulfilment of an idea conceived while he was on active service between 1914 and 1918. Writing home, Spencer said, “We are going to build a church and the wall will have on them all about Christ.” Many artists, like C.R.W. Nevinson, Paul Nash and Mark Gertler, painted the stark reality of their experiences of the battlefield during the Great War. 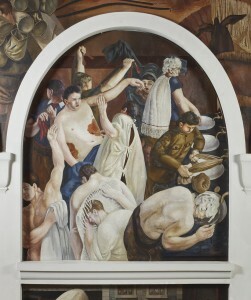 In contrast, Stanley Spencer’s depictions of war centre on scenes of daily life at the Beaufort War Hospital in Bristol and times between the fighting in Macedonia. Some critics have implied a quality of escapism in these works but this is to misunderstand the integrity and Christian faith of this visionary artist at this time. 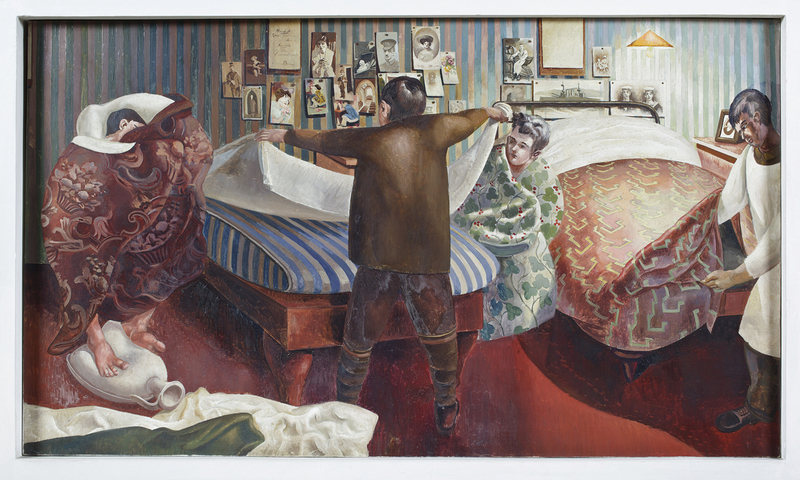 Works like ‘Bed-Making’ show the domesticity and Spencer’s attempt to bring sacrifice and service into the harsh realities of the hospital and men’s injuries, as depicted in ‘Ablutions’. 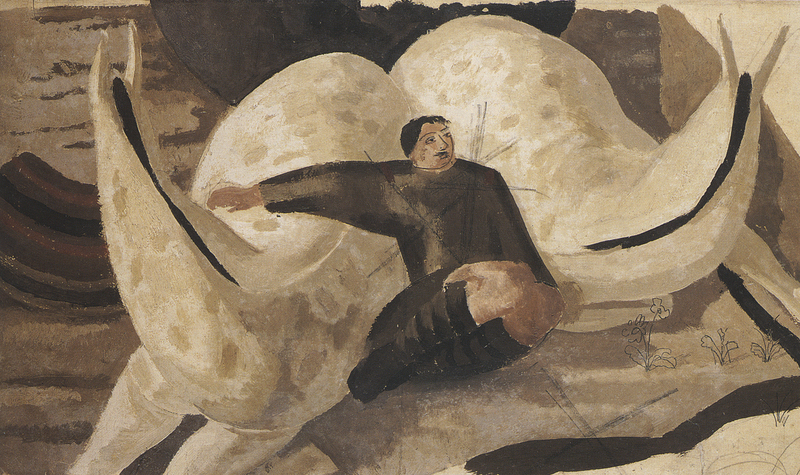 Stanley Spencer was influenced by St. Augustine’s writings and the possibility of holiness being lived out through ordinary, everyday tasks when carried out with the qualities of love and service. Spencer’s work speaks of the beauty and compassion in humanity, of hope, in contrast to man’s inhumanity to man. There is no doubt that Spencer worked in a very methodical way. The sketches in the exhibition are carefully prepared with grids to enable them to be transferred accurately onto large-scale canvas panels. He would inch across the canvas, starting top left, and work meticulously, almost never retracing his work. This exhibition allows the viewer the opportunity to note some squaring through the paint. Spencer described his method of working when he said, “I find I am painting things… in the same order in which God created them; first the firmament… then all the bare earth bits and the river bits, then the bushes and flowers and grass and trees and creepers and here I also do walls and buildings, then come animals and human beings together at the end.” His love of nature and his skill as a painter is exquisitely depicted in ‘Map-Reading’. Here the artist’s extraordinary richness of palette becomes apparent, something which is difficult to discern in the limited natural light in Sandham Memorial Chapel. 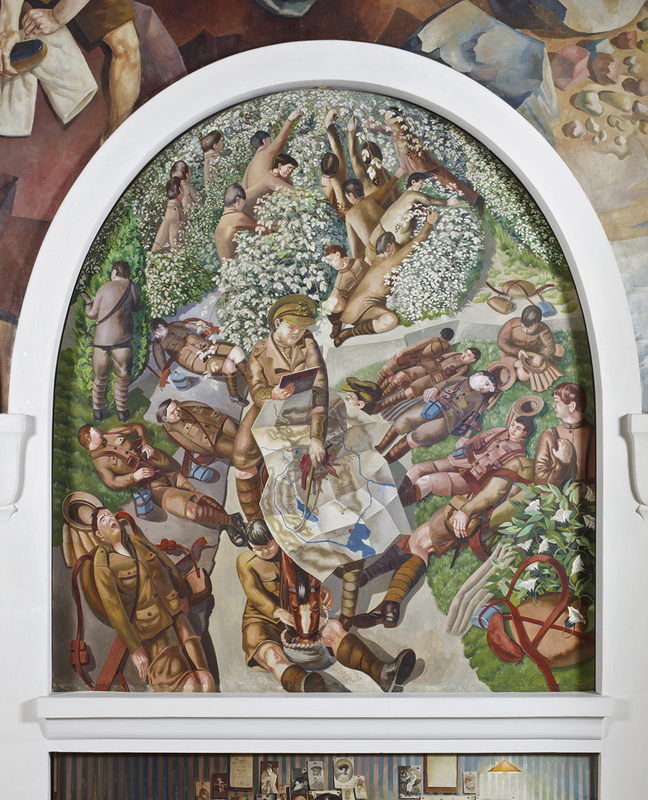 This exhibition runs until 15th June 2014 when the paintings will return to Sandham Memorial Chapel, which is currently closed for restoration works. Our thanks should go to Amanda Bradley and David Taylor from the National Trust, who curated this exhibition, and to Simon Martin and team at Pallant House Gallery. Together they have given us an extraordinary opportunity to view these works in an entirely different way to that which is normally possible. I am delighted that Toovey’s are headline sponsors, together with the Linbury Trust and the National Trust, enabling this remarkable and important exhibition to come to Sussex. 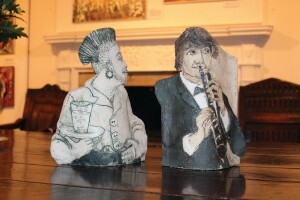 For further information of talks and events relating to the show go to www.pallant.org.uk or telephone 01243 774557. The excellent catalogue of the exhibition is available from the Pallant House Gallery Shop, priced £19.95. 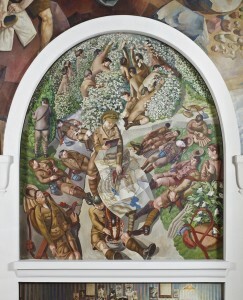 All images ©the estate of Stanley Spencer, 2013. All rights reserved DACs, National Trust Images/John Hammond. By Revd. Rupert Toovey. Originally published on 26th February 2014 in the West Sussex Gazette. This week I am back at Horsham Museum & Art Gallery with my brother, Nick Toovey, for the opening of a new art show, which celebrates the work of Washington-based artist Alison Milner-Gulland. This selling exhibition runs until 29th March 2014. From her teens until only a few years ago Alison regularly rode on the South Downs, committing to memory the play of light and the elements on the landscape with the movement of her horse. The elevated perspective that riding affords is evident in many of her landscapes. Through her eyes we see the sweeping chalk curves, ancient tracks, rolling hills and far-reaching views of the Downs. 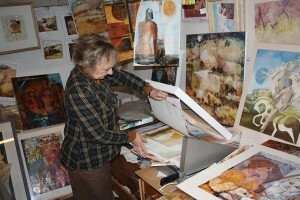 Later, in her studio, she would transfer these thoughts and images to paper and canvas. 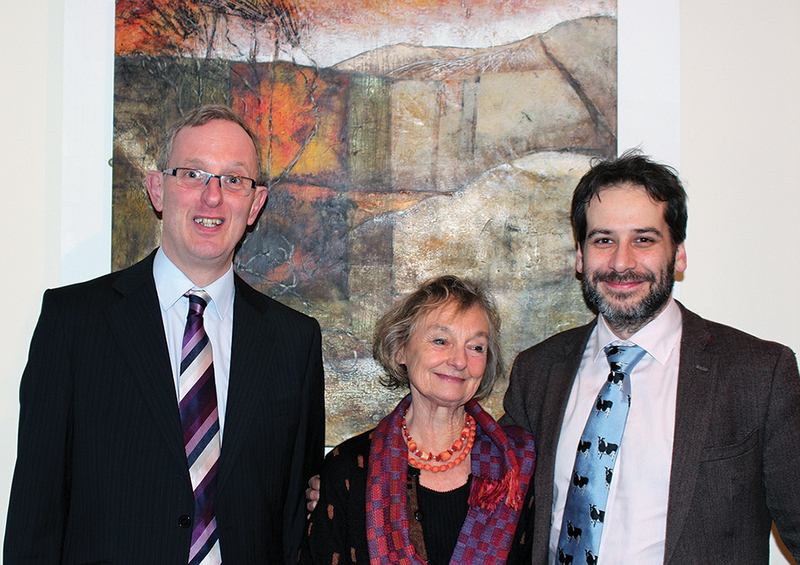 The ancient quality of the South Downs is perfectly captured in ‘Deep in the Downs’, shown here with exhibition curator Jeremy Knight, Alison and Nick. Alison’s ceramics give expression to her creative voice. The two slab vases illustrated capture the musician and the waiter with a Mohican hairstyle wonderfully. “I felt moved to draw the waiter in the restaurant,” Alison says. “He had a particular confidence, which caught my attention, and that marvellous hair. I hadn’t got anything to draw on, so I sketched on a napkin held under the table!” Unsurprisingly, they were amongst the first pieces to sell at the exhibition. 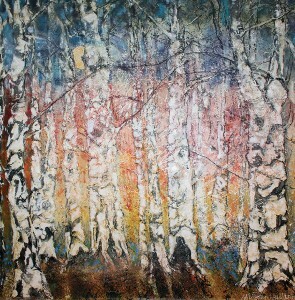 Russia has provided a rich seam of inspiration and the landscape depicting a silver birch wood has grown out of this. “My paintings develop and evolve as I continue to work on them until they are sold,” Alison explains. This perhaps, in part, explains the layers and depths which Nick describes, but it is also the depth of connectedness with the world around her which gives her a particular and distinctive artistic voice. Toovey’s are delighted to be sponsoring this exhibition, aptly titled ‘Alison Milner-Gulland: Constantly Updating’, and the works are selling well. Jeremy Knight and his team are once again deserving of our thanks for an excellent show of work from this insightful Sussex artist. 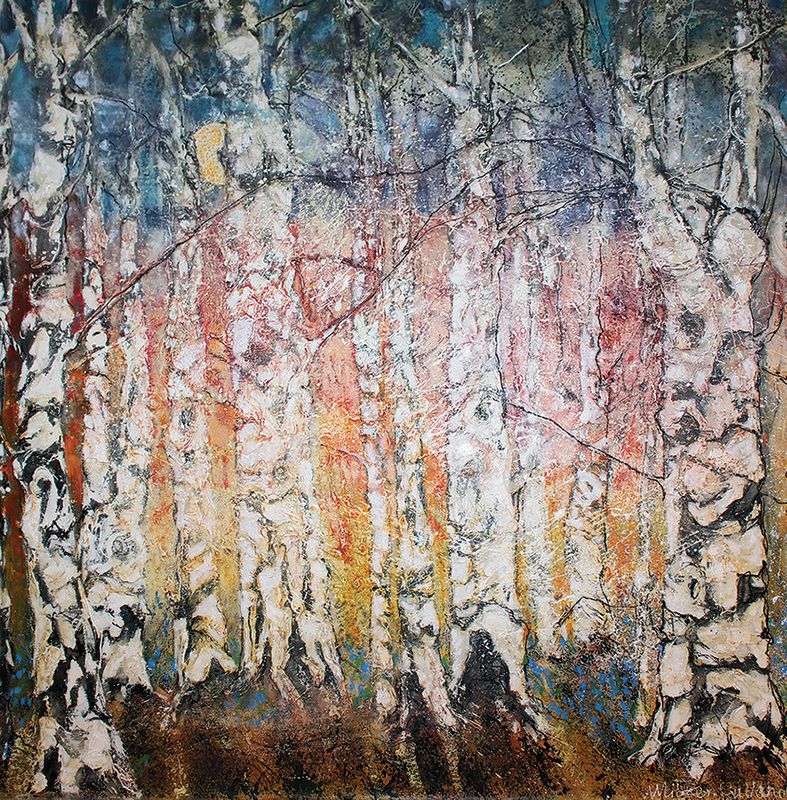 Nicholas Toovey is always pleased to advise and share his passion for contemporary artists, especially from Sussex. He can be contacted at Toovey’s. By Revd. Rupert Toovey. Originally published on 19th February 2014 in the West Sussex Gazette. 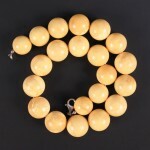 Green Light for Amber Beads at Auction! Further to our blog post ‘Amber Beads in Fashion at Toovey’s‘ and Rupert Toovey’s article in the West Sussex Gazette ‘Prehistoric Treasure in Demand Today‘. 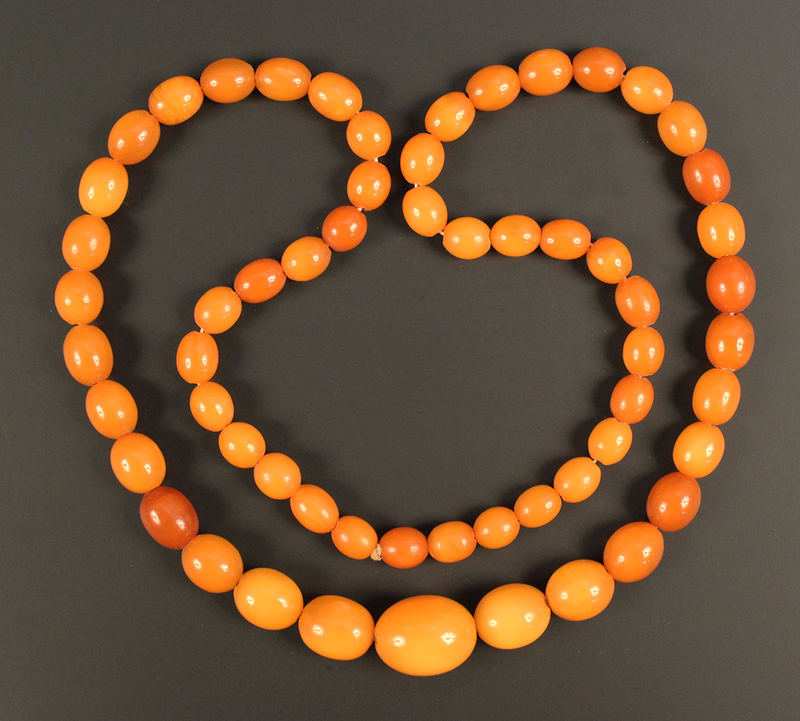 We wanted to share some of the prices achieved for amber beads in our January auction on the 29th January. 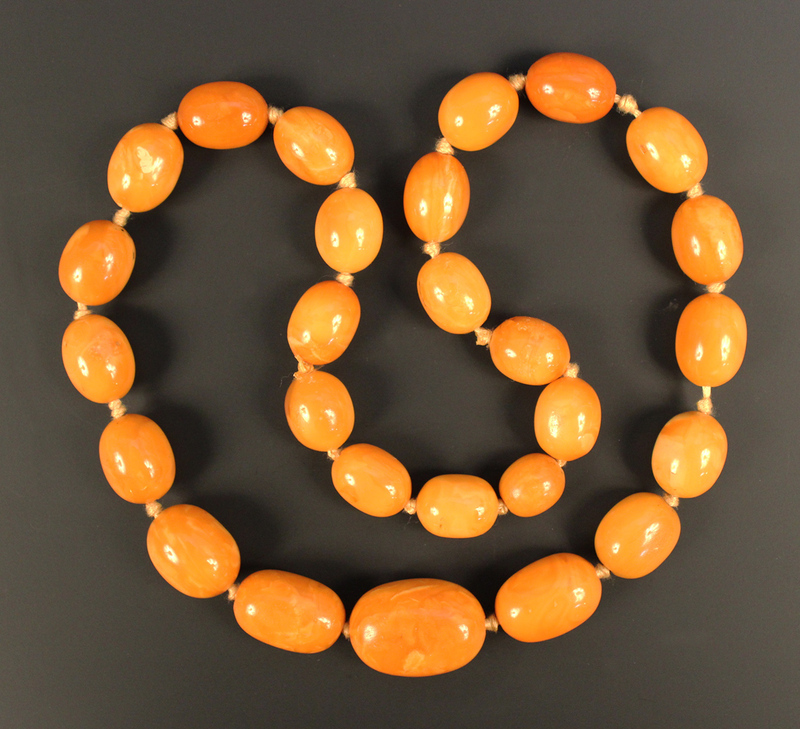 Highest price was £10,000 for a single row necklace of thirty-eight slightly graduated oval vari-coloured opaque and semi-translucent butterscotch coloured amber beads, total weight approx 255g, total length approx 110cm, length of smallest bead approx 2cm, length of largest bead approx 2.7cm. More amber beads are consigned in our Specialist Sale of Jewellery on 26th February 2014. See lot numbers 640-664. 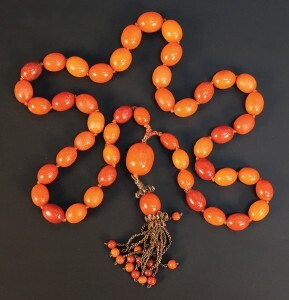 If you would like your amber beads valued for possible inclusion into a forthcoming auction please contact our offices, pre-sale valuations are free of charge at our Spring Gardens salerooms. When collectors from China, India and the Middle East simultaneously decide to pursue the same collectors’ items, the effect on prices can be sudden and dramatic! 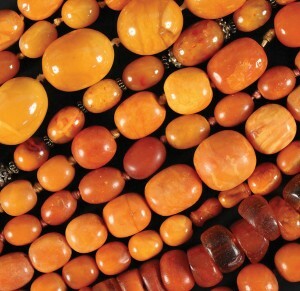 In recent times the market for amber beads has been transformed with many thousands of pounds now being paid for the most sought-after examples. 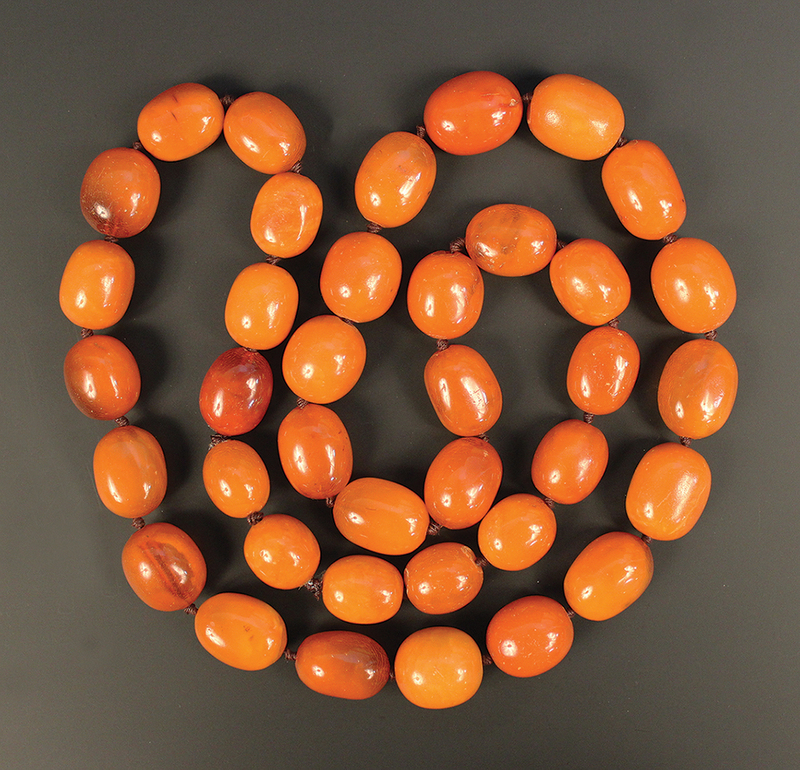 Since the Neolithic period amber has been celebrated for its colour, beauty and supposed healing properties. 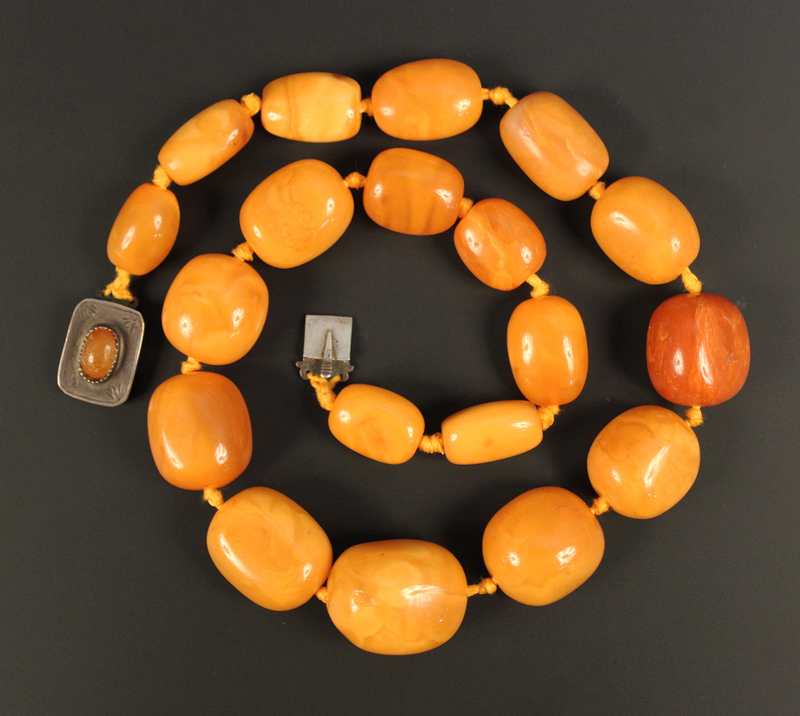 In classical times, the Greeks called amber ‘electron’. According to myth, after the death of Phaethon, the son of Helios (the Sun), his sisters wept for him unceasingly and were changed into poplars. These trees continued to ooze tears, which were hardened by Helios into amber. This classical articulation of the origin of amber is not so far removed from our own understanding of amber as fossilised tree resin. This sticky resin often captured insects and plant material, which can be seen in some examples of amber. The image of trapped insects in clear, golden amber found a place in contemporary culture at the heart of Michael Crichton’s novel ‘Jurassic Park’ and the subsequent film of the same title. Film fans amongst you will remember that in this story DNA extracted from the blood of a prehistoric mosquito preserved in amber was used to recreate dinosaurs. Examples of amber with insect and plant inclusions were highly prized by Victorian collectors and aesthetes and until quite recently this transparent amber remained the most sought-after. 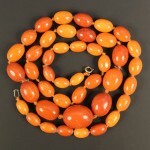 But a recent change in fashion has resulted in another type of amber realising astonishing prices. It is less translucent with an almost milky quality to its appearance. 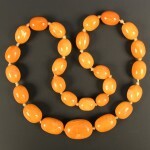 ‘Butterscotch’ amber, as it is known, and its variants became fashionable in modern times during the 1920s. Interest has ebbed and flowed over the ensuing decades. 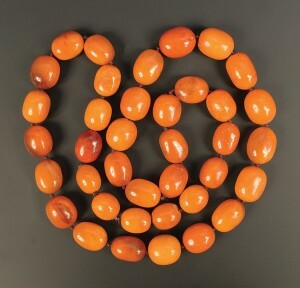 Today this specific type of amber has captured the eye of collectors from the emerging economies of China, India and the Middle East, creating demand on a scale which was unimaginable only a short time ago. 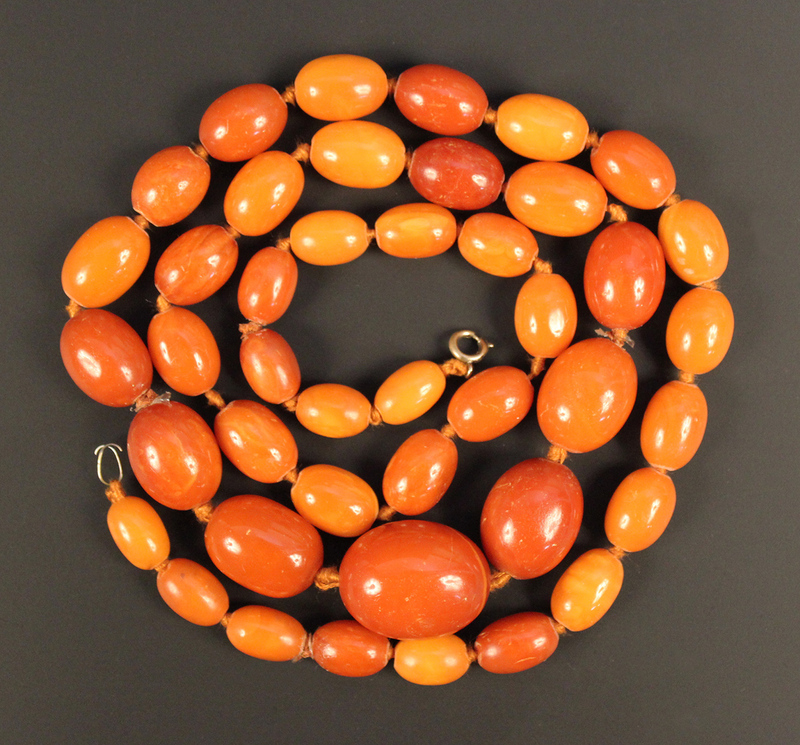 This extraordinary change in the market has brought a good number of old amber necklaces to auction. Take, for example, the necklace arranged in the photograph as a heart. Comprising forty-nine mottled yellow butterscotch amber beads, weighing 278g and measuring 136cm in length, it sold in Toovey’s New Year’s Eve auction for £11,000 with competition from across the Near and Far East. 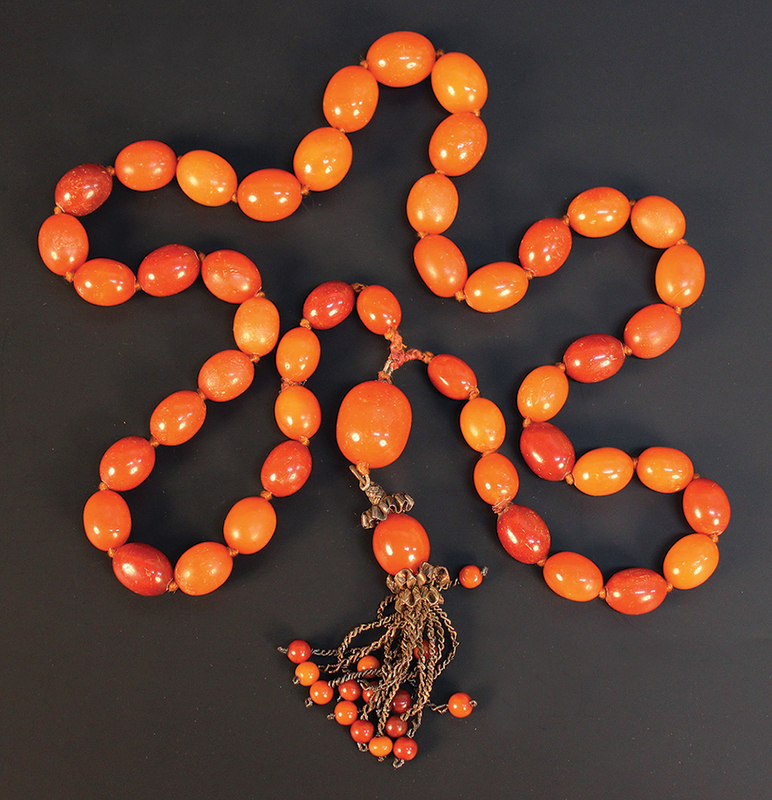 The thirty-eight bead necklace illustrated, weight 255g, length 110cm, featured vari-coloured opaque and semi-translucent butterscotch amber beads and realised £10,000 in our January specialist jewellery sale a fortnight ago. 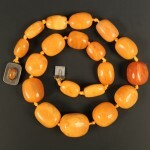 The necklace of forty-seven brown and butterscotch amber beads, which realised £3,800 in November last year, was a favourite of mine. The beads had a flame-like quality to their appearance and were complimented by the charming tassel drop, finished with smaller beads. 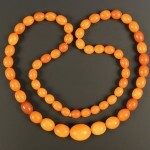 Differences in prices paid for amber necklaces are largely attributable to the colour, number and size of the beads. They are not all as expensive to buy as these three; a reasonable example can still be found at auction for about £700. These days, though, you are as likely to find yourself up against a bidder from Mumbai or Beijing as you are against a bidder from London or the home counties. With global internet marketing providing a truly international shop window, these pieces are only a mouse-click away for specialist buyers across the globe and many in the emerging economies have deep pockets indeed at present. 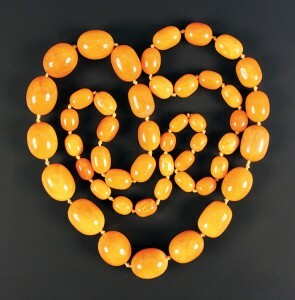 Another group of amber necklaces will be offered in our next specialist jewellery auction on Wednesday 26th February 2014. By Revd. Rupert Toovey. Originally published on 12th February 2014 in the West Sussex Gazette. Horsham Museum & Art Gallery’s exhibition ‘The First World War 1914-1919 Memories and Memorabilia’ begins a year of commemorations in remembrance of the outbreak of the Great War on 28th July 1914. Three generations were united by the experiences of the First and Second World Wars, wars which for the first time brought industrialized might to the battlefield with terrible consequences. The images of the Great War still have the power to shock a century later and they inform our perspectives and understanding of this period. Amongst sorrow, suffering, sacrifice, courage, duty and hope, however, there are the very human and personal stories. This excellent exhibition seeks to give us fresh insights. I grew up with men who had fought in the trenches, men who had experienced gas attacks and the heat of battle and their stories have stayed with me. During the 1970s Jane Bowen interviewed and recorded the recollections of a number of soldiers, which have been transcribed for this exhibition. 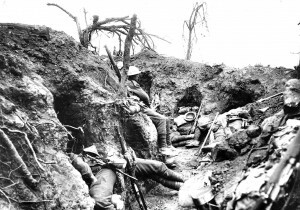 I had pictured troops in the trenches for months at a time whereas these recordings reveal that troops were in fact rotated on a regular basis. 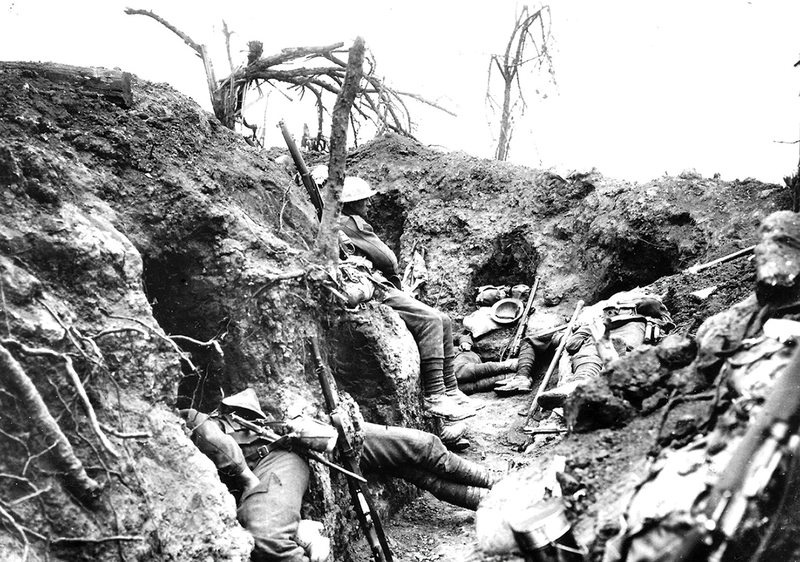 On average, a battalion could expect to spend ten days a month in the trenches and four to five days a month continuously in the firing line. Such care for our troops stands in contrast to the huge loss of life at the Battle of Mons and elsewhere. Their recorded memories give a very human account of the realities of life in the trenches. Christ’s Hospital school has generously loaned the uniform of Edmund Blunden, the celebrated war poet and a former pupil of the school. Blunden cycled from Horsham to Chichester to sign on and the war played a key part in his life and poetry. Along with such memories there is a remarkable selection of objects, which provide a tangible connection with the past. These include a First World War periscope, valentine cards, silk handkerchiefs, uniforms and knitwear. There are also the medals awarded to Dr Geoffrey Sparrow, who settled in post-war Horsham, along with a rare copy of On Four Fronts, his account of the war. 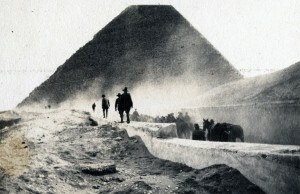 The watercolour of a convoy in the Middle East, painted by Sparrow during the Second World War and auctioned at Toovey’s last year, adds richness to the photograph of troops beneath an Egyptian pyramid, taken during the Great War, which is included in the exhibition. Jonathan Chowen concludes, “I am keen to encourage and make visible the extraordinary number of acts of remembrance which are taking place across the Horsham District. The outbreak of the Great War one hundred years ago will make Remembrance Sunday and Remembrance Day particularly poignant this year.” I agree. I have not been called to serve my country on the field of battle. I feel a debt of gratitude to those who fought in the two World Wars and those who serve in our armed forces today, so that we may live in relative peace and security. 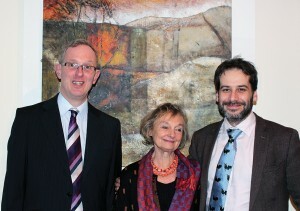 This is an exceptional exhibition and thanks must go once again to curator Jeremy Knight. 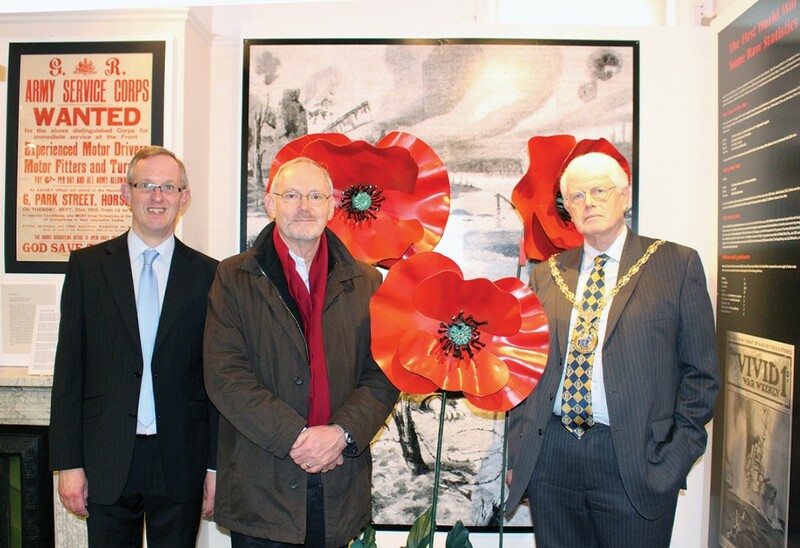 ‘The First World War 1914-1919 Memories and Memorabilia’ runs at Horsham District Council’s Horsham Museum & Art Gallery until 29th March 2014. For further details contact Jeremy Knight at the Museum. By Revd. Rupert Toovey. Originally published on 5th February 2014 in the West Sussex Gazette.